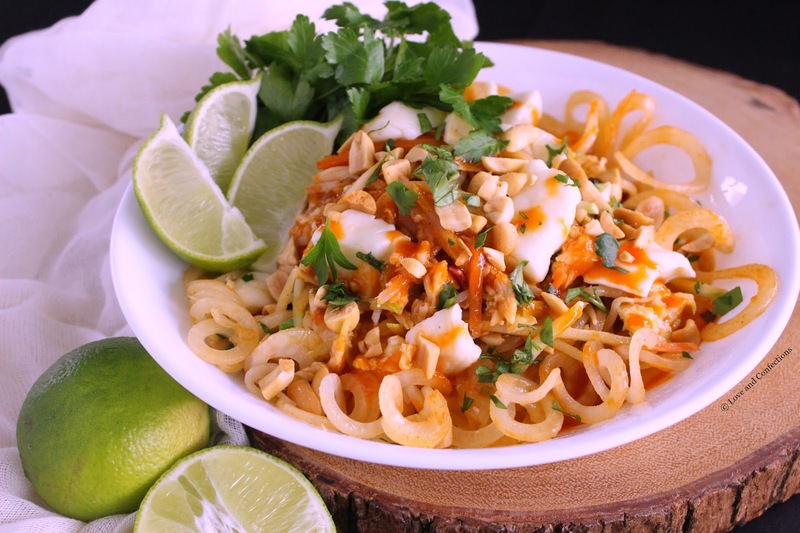 Poutine Pad Thai is an Asian twist on the classic French-Canadian dish, with Idaho Potato Noodles, Vegetables, Chicken, and Cheese Curds. Peanuts, Cilantro and Lime Wedges complete the dish for a colorful and unique presentation! 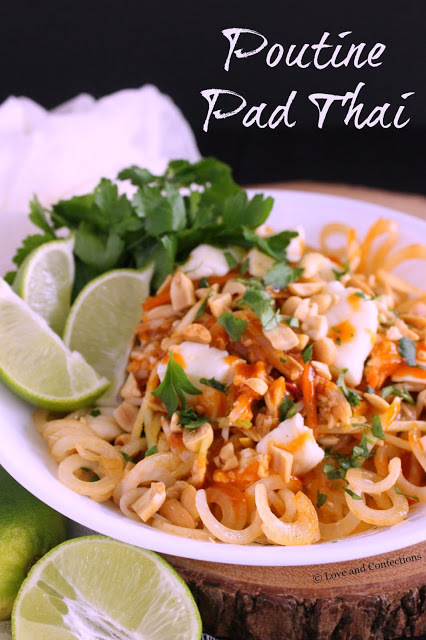 I put an Asian twist on the classic, by substituting Idaho Potatoes for regular noodles in one of my favorite dishes – Pad Thai! Poutine, a French-Canadian classic, is traditionally French fries, brown gravy, and cheese curds. I am entering this dish into the Idaho Potato Commission Recipe Contest for National Sunday Supper Month. We were tasked with creating an original dish, inspired by the classic. There are so many different and delicious recipe interpretations from fellow food blogging friends. 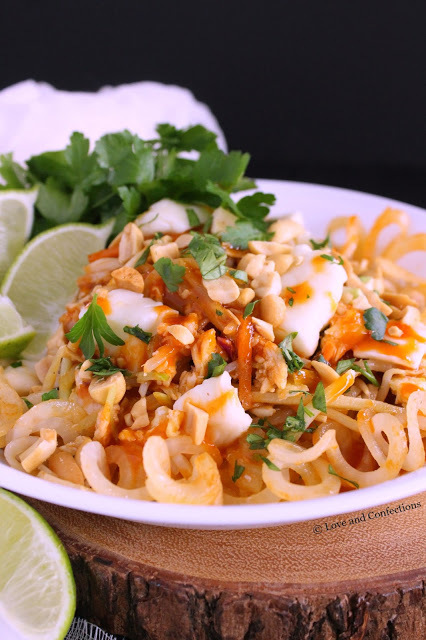 One of my shortcuts is to use jarred Pad Thai sauce, because I can never really get the same flavor when I make it from scratch. 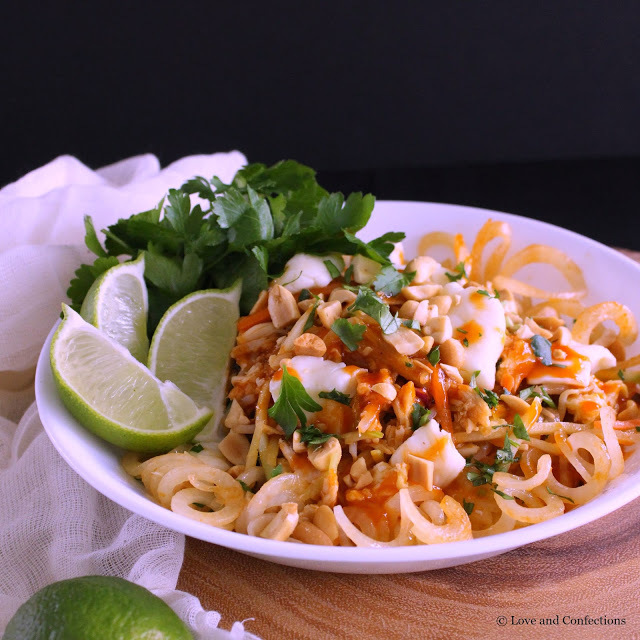 Broccoli Slaw and Bean Sprouts are a must in my Pad Thai, as well as scrambled eggs. I cooked extra chicken earlier in the week and shredded it for this recipe. Sometimes I use pork or shrimp too. 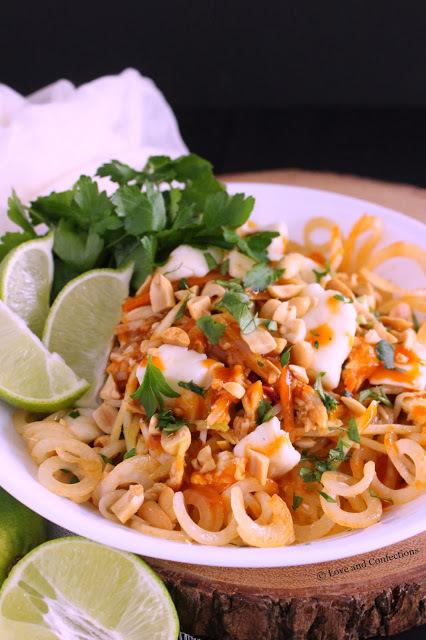 The cheese curds are an unexpected twist, but they actually go really well with the Pad Thai Sauce. I love sprinkling chopped peanuts and cilantro on top and using freshly squeezed lime juice. 1. In a large saute pan, heat Oil in the pan, then scramble the Eggs, remove and set aside. Add a bit more Oil, then the Chicken and 2 tablespoons of Pad Thai Sauce and cook until heated through. Remove and set aside. 2. Add a bit more oil into the pan and add in the Broccoli Slaw. cook for 2 minutes then add in 2 tablespoons of Pad Thai Sauce. Cook another 2 minutes before adding in the Bean Sprouts. Add an additional tablespoon of Pad Thai Sauce and cook for 4-6 minutes. Remove and set aside. 3. Peel Potatoes, spiral into medium-sized noodles, cutting the long strands in 2-3 pieces. Heat Oil in the pan, and cook potato noodles for 10 minutes, stirring often. Add in 1 tablespoon Pad Thai Sauce and stir to heat through. 4. Add all the cooked ingredients back into the pan and toss to combine with potato noodles and make sure everything is hot. Serve immediately. Top with Cheese Curds, chopped Peanuts, Cilantro and Lime Wedges. Enjoy! Disclaimer: This recipe was created as an entry for the Idaho Potato Commission Recipe Contest for National Sunday Supper Month. Contest entries are equal opportunity for all Food and Wine Conference participants.